Metabolism is the sum of the chemical reactions that take place within our bodies’ cells to sustain our lives. 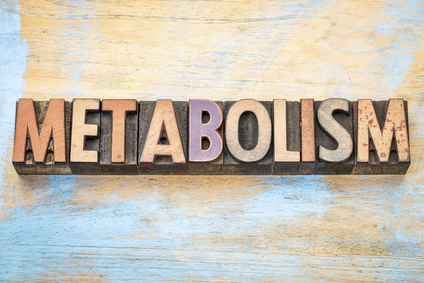 Metabolic rate is the rate at which our metabolism expends energy, both at rest and when active, and thus the rate at which the body burns its substance (usually fat). This is a vast subject, but our concern here is with so-called metabolic syndrome, which we ran across when we were talking about hormones and about the blood. We can define metabolic syndrome as an unhealthy ratio of body muscle to body fat. I’m broaching this subject again, this time under the broad heading of aging, but metabolic syndrome is most certainly not confined to the elderly—we can see this plainly just by walking down the street. Yet our metabolism does slow with age and many people who were slim in their younger years struggle with excess weight as they age. As is now widely recognized, North America is in a state of health emergency: an obesity epidemic in which more than 60 percent of us are overweight and 25 percent are considered obese. Even more alarming is the fact that approximately 20 percent or more of us don’t even realize that we need to lose excess body fat. And you aren’t safe just because you appear to be of normal weight. Despite looking relatively trim, many people have altered or unhealthy body composition, that is, they carry too much fat tissue relative to lean tissue such as muscle. The consequences of unhealthy body composition are many and they are very similar to obesity: heart disease, hypertension, back pain, high cholesterol, stroke, sleep apnea and metabolic syndrome, to name a few. Metabolic syndrome affects about 46 percent of the North American population and is characterized by high blood pressure, high cholesterol, high blood insulin and glucose levels and, as a rule, a waist circumference greater than 40 inches for men and 35 inches for women. These factors significantly increase the risk of type 2 diabetes, heart disease and stroke and are all easily measured by a competent practitioner. Recent studies are also finding a significant association between metabolic syndrome and Alzheimer’s disease. And since estrogen can be produced by fat tissue, our hormonal balance too can be affected by unhealthy body composition.